Why start looking out for VUI design? Voice-user interface, or VUI, has exploded in popularity over recent years. 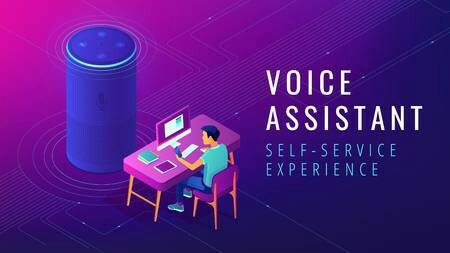 VUI uses speech recognition technology to enable users to interact with technology using just their voices. Virtual assistants like Siri and Alexa have brought VUI into the mainstream, with corporate giants like Google and Sonos following their lead. Companies like Synqq and Nexmo have also taken advantage of VUI technologies in order to develop devices that allow real-time translation and transcription. Amazon with its Echo range of smart speakers, led the category with 59 percent market share, closely followed by Google for the second position, showed IDC’s Worldwide Quarterly Smart Home Device Tracker as per 2018. Skills are specific capabilities that enable designers and developers to create a more personalized voice experience when using devices like the Amazon Echo Dot. They operate much like an app within the App store on your smartphone, allowing you to customize your voice assistant. There are over 30,000 Alexa skills on Amazon with an average of 50 new ones being published daily. How to design for VUI’s. Is this voice interaction necessary? Is it better than interface interaction? Does the use scenario you imagine actually exist? Will the voice interface become the primary interface in your usage scenario? After determining what task(s) we’d like Alexa to assist with, we need to consider the essential information flow to complete these jobs-to-be-done. What is the minimal information exchanged (MIE) that will get the job done? What are the key decisions that users need to make? What response will Alexa give corresponding to these decisions? Think about this step as building information architecture (IA) for inter-faceless design. The major difference between IA in interface design and IA in inter-faceless design is that IA for inter-faceless design is unidirectional, meaning that users can’t go back to the last step in a conversation flow. After establishing the information architecture, it’s time to do our brainstorming around conversations. Instead of demonstrating interactions using linked hotspots, designers need to build VUI flow with Alexa’s language. That means we will use intents, utterances, and slops. These are some of the key areas to focus on while designing VUI design. Efficiency is the primary motivation for using voice. To design highly-efficient VUI, designers will focus on reducing cognitive load — an amount of mental effort required to use a system. The user should know when the system is listening, when it is processing and when it is speaking. Since voice interfaces have to deal with a lot of misunderstandings, the system should also inform users when something is wrong. Visual cues (like an animated light ring on Alexa) and nonverbal audio (like ear-cons) can help in communicating the system status. One of the classic usability heuristics is error prevention: the notion that rather than just help users recover from errors, systems should prevent errors from occurring in the first place. As speech recognition has improved in recent years, errors in natural-language understanding have dropped significantly. GUI have shortcuts (like advanced filters and keyboard shortcuts) for power users. VUI can have shortcuts too like skipping welcome message for someone who uses the system more than 5 times a day and avoiding unnecessary confirmations. Amazon introduced a brief mode for Alexa in which it speaks less and for some simple messages it plays a short sound instead of a voice response. When people talk, they often don’t express their full intentions. We’re used to taking shortcuts, using slang, and intimating and hinting at what we really want a lot of the time. in voice user interfaces, expressing intentions is necessary for the system to understand what the user wants. Moreover, the more information about her intentions a user includes in a sentence — the better. Amazon uses the app Horoscope Daily as an example. A user can say, “Alexa, ask Astrology Daily for the horoscope for Leo.” and get the information she wants right away, instead of first saying, “Alexa, ask Astrology Daily for the horoscope.” and then asking for the horoscope she wants. Users might not realize this on their own, but you can demonstrate it to them if you use full intentions in all your examples of an interaction — e.g., in your written user guide or when the user asks the system for help or more information in relation to an interaction. Have attached a demo video for everyone. Leave a comment if you can access the game or would like to say something about it. Exploring the new realms of VUI: Conversational Design was originally published in UX Planet on Medium, where people are continuing the conversation by highlighting and responding to this story.